Arab MK Hanin Zoabi compares Israel to Germany in the 1930s, says Israel should grant right of return to Arabs - but not Jews. Speaking at The Jerusalem Fund and Palestine Center in Dallas last week, Arab MK Hanin Zoabi (Joint Arab List) openly admitted that Jews do not have a right to self-determination, and that Israel should not exist as a Jewish state. "It's an equality which challenges the definition of Israel as a Jewish state," Zoabi said. "We use this democracy - of course, there is a question of why you...give legitimacy to Israel when you are within the Knesset. This is true. So remember, I am telling you now that now we have the ability to use these tools, the democratic tools, for our own interests, for our own national approaching [sic]." "It is not enough that Israel should exit, should leave Gaza and the West Bank. "Zionism should leave also, from the whole area... There are articles in Haaretz, you can read. Israel now resembles Germany in the thirties... We also within this vision define the matter of self-determination, not for the Jews - for the Israelis." Zoabi then said that the Jewish people are not a nationality, but admitted Israel has a right to self-determination. "The answer we give is that the Jews are not nationality, so we cannot talk about self-determination for the Jewish people," Zoabi said. "But for the Israelis, they can have self-determination. But not as a Jewish state - within a secular democratic state." "I will finish by saying that our struggle for human rights...for collective and civic equality...and the right of return...when you say that this will eliminate us, this democracy will eliminate us...this proves that Zionism is racism." 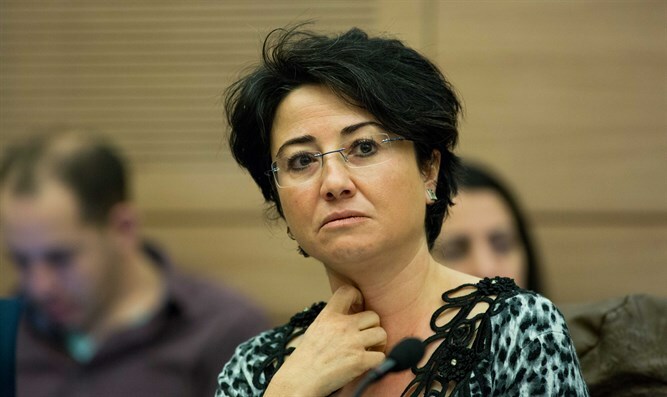 Zoabi called on Israel to cease security coordination and not grant automatic citizenship to any Jew who wishes to immigrate under the Law of Return. "What to do?" Zoabi asked. "In the macro, I don't know. I know in the micro, immediately to stop security coordination....but the vision... Okay, this is what we say. The vision is full equality, right of return, to change all the citizenship laws, no automatic guarantee, no automatic citizenship to any Jewish [sic], and of course the right of return to the villages, and to the houses of the refugees." "Jews who don't want to accept that, yeah, they are allowed to go, to return. The vision of a state, of a democratic state, entails a huge compromise. "It's not one hundred percent justice... It is a strength also, in front of the international community that yes, we are suggesting a huge historical amount [sic], to give up the name even of Palestine in Haifa... This is, for us, a compromise."